Why do I Want a Static IP Address? An IP Address (Internet Protocol) is a a set of numerical digits that identify a device and its location on a network. It is similar to your house address except that it uses numbers. If your Raspberry Pi is connected your Router then it will automatically be given its own IP address. The issue is that this address will change each time you log on and off. This is know as a Dynamic Address - it changes. 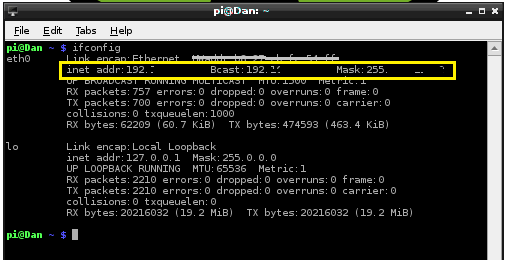 A Static IP Address remains the same all the time and makes it easier to access your Pi. Basically you need to identify your current network settings and modify them so that the IP Address remains static. Firstly check that your address is not already Static . This will load an overview of the connected network devices, you are looking for the third line which states: iface eth0 inet dhcp The DHCP means that your IP Address is Dynamic and will change when you turn the Pi off. The next part is to collect the Destination and the Gateway address. There are two commands that you can use the access them. The final part of the Static IP process is to open the original cat /etc/network/interfaces file in edit mode. Remember to replace the addresses with the ones from your network that you collected earlier. The c-10 only sends 10 pings!